Arles à la carte offers two different types of classes: Inside the Classroom and Outside the Classroom. For those who want the best of both options, we also offer a combination class: In & Out. Courses are taught in an Individual, Duo (2 people)* or Small group (3-8 people)* setting by Français Langue Etrangère (FLE) language instructors with extensive teaching experience with students of all ages and levels as well as considerable cultural and historical knowledge of the area. 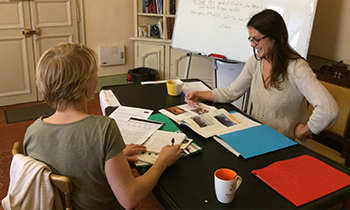 Students pass an initial language placement test before arriving in Arles in order to set the language level and plan the course according to the student’s individual needs and language goals. 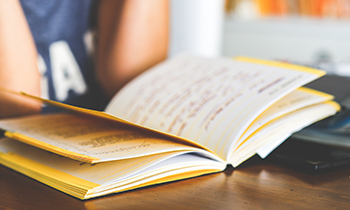 Whether students are preparing to pass a language exam, improve their French for professional reasons, or simply feel more comfortable while visiting the area, the Arles à la carte language instructors will adapt to each student’s objectives. Students also pass a written and oral evaluation at the end of the program to measure progress made while in Arles. A report is provided at the end of program stipulating the course content, all grammatical points that have been mastered as well as what could be improved at the student’s individual level. A certificate of completion is provided on the last day. 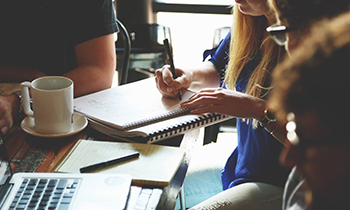 * In order to sign up for Duo or Small group (3-8 people) classes, the 2-8 people participating in the class must sign up together and have the same language level, as proven by the language placement test. Want to bring your French grammar up to par? Would you like to develop your French cultural knowledge while working on grammatical structures and idiomatic expressions? A total beginner? This option is for you! 2 hours of French Grammar and Culture and 1 or 2 hours of French Conversation. • The Grammar and Culture portion of the class focuses on grammar, vocabulary and oral/written comprehension. The grammatical points are presented in a cultural context, using different aspects of French society and life to illustrate each notion. Instructors use a variety of pedagogical materials including: French language books (Vite et Bien, Grammaire en Dialogues, etc); dialogues; discussions; articles and short videos from the French press; grammatical exercises; various language games to reinforce vocabulary and fluidity. • The Conversation portion of the class follows up on the morning session by presenting different cultural topics related to French current events, education, way of life, stereotypes etc and developing the French art of animated conversation ! Want to make the most of what Arles has to offer and be able to put your French to good use, with the guidance of a language instructor? This option is for you! 1 or 2 hours of language instruction in the classroom to present necessary related grammar and expressions, then 2 hours of related activities “outside” of the classroom. Practical walking tour around Arles to find a few places that you’ll need to know during your stay as well as major historical sites. Stop by the boulangerie to pick up a croissant or two, get La Provence from the newspaper stand and then go to a local café with your French instructor to spend the morning à la française, all the while practicing the necessary language structures and idiomatic expressions. Explore the market, find and purchase a certain number of items, and if desired, return to the language center to prepare and enjoy a market-bought lunch ! Revive your artistic side, learn art-related vocabulary and try your hand at painting, sketching, drawing and origami making among others, all in French ! What better way to develop your vocabulary and fluidity in French than through language games? From “Taboo” to “Dixit”, or even a game specifically designed by the Arles international photography festival committee (les Rencontres d’Arles), all of the proposed games will get students thinking, speaking and playing in French in a way they might not have known they could before ! Want the best of both options, with certain days Inside the classroom and other days Outside the classroom? This option is for you! Over a 5-day period, 3 days Inside the classroom (see details above) and 2 days Outside the classroom (see details above, choice of 2 of the listed activities).